By popular demand: Json.NET 4.0! This is the first Json.NET release to target .NET 4 and integrates the many new features added in the latest version of .NET. Behind the scenes Json.NET’s source code has been upgraded to VS2010. Other major changes in this release are two new builds and the removal of an existing build. Removed is Compact Framework. VS2010 no longer supports Compact Framework so 3.5 r8 will be its last release if you are targeting the Compact Framework. New on the other hand are builds for .NET 3.5 (the main build has been upgraded to .NET 4) and Windows Phone. Json.NET 4.0 comes with a Windows Phone specific dll, compiled using the Windows Phone tools. The Silverlight build now targets Silverlight 4 so is no longer compatible with Windows Phone. A couple of little bonuses of Windows Phone having its own dll is that it doesn’t prompt with a warning when added. There is also some additional XML support. Because LINQ to XML is included in Windows Phone by default (it is an add-on dll for Silverlight) the Json.NET Windows Phone build has some XML features that are missing out of Silverlight release. One of the more interesting features introduced in .NET 4 is the dynamic keyword. Succinctly it allows variables and members to be statically typed as dynamic. The .NET type system that you know and love remains but operations involving dynamic values are evaluated at runtime. Json.NET 4.0 adds support for dynamic in a couple of areas. The first and less visible of the two is in the JsonSerializer. Because there is no static list of fields or properties for a dynamic type the serializer interrogates the value for its members prior to serializing and deserializing. The end result is serializing should Just Work for any type that implements IDynamicMetaObjectProvider. The second area with new dynamic support is LINQ to JSON. JObject properties can be accessed like that were members on a type and JValues can be converted to .NET types without casting, saving you the consumer precious KLOCs. 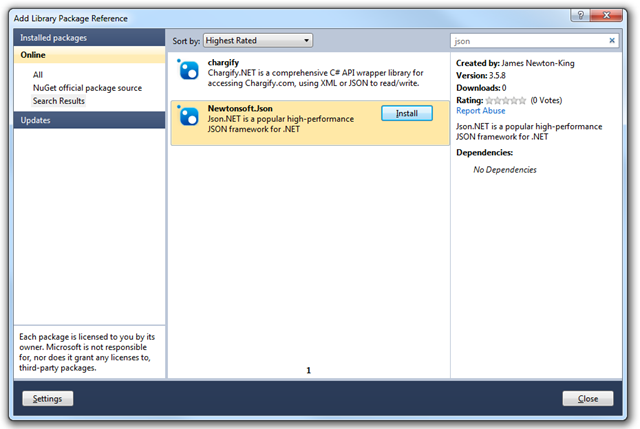 Json.NET has a NuGet package available from the official NuGet package source. Right now it has Json.NET 3.5 Release 8 but expect it to be updated to Json.NET 4.0 in a couple of days. Json.NET’s JSON Schema implementation has been updated to match version 3 of the specification. Notable new additions are patternProperties, exclusiveMinimum and exclusiveMaximum. Also new is the removal of optional which has been replaced with required. If you are using JSON Schema then you should check whether this change effects your schemas. The BSON spec has changed how binary values inside BSON should be written, deprecating the way Json.NET use to write binary values. Json.NET has been changed to use the new method. Also worth noting is Json.NET had a bug with how it use to read and write the old binary values – this is fixed in Json.NET 4.0 but existing incorrect binary values will remain. Setting JsonNet35BinaryCompatibility on BsonReader will fix reading any existing BSON after upgrading to 4.0 but because of this bug and the change in how the spec says BSON binary values should be written it is recommended to update existing BSON to keep things consistent. This can be done by setting compatibility flag to true, reading BSON and then writing it back out again. These changes only effect BSON that has binary values (i.e. byte arrays) written inside BSON. Here is a complete list of what has changed since Json.NET 3.5 Release 8.